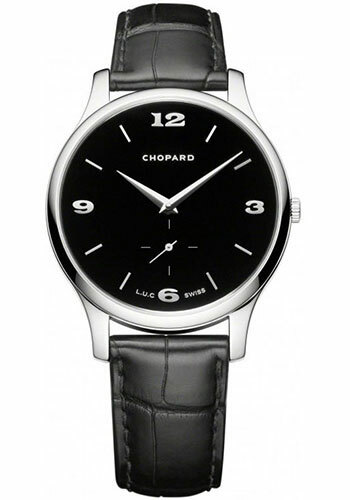 39.50 mm 18K white gold case, sapphire crystal back, black dial, automatic self-winding L.U.C 96.12-L movement with hours, minutes, and small seconds, approximately 65 hours of power reserve, hand-stitched black alligator strap. Water resistant to 30 meters. 39.50 mm 18K white gold case, sapphire crystal back, silver dial, automatic self-winding L.U.C 96.12-L movement with hours, minutes, and small seconds, approximately 65 hours of power reserve, hand-stitched black alligator strap. Water resistant to 30 meters. 39.50 mm 18K rose gold case, sapphire crystal back, silver dial, automatic self-winding L.U.C 96.12-L movement with hours, minutes, and small seconds, approximately 65 hours of power reserve, hand-stitched brown alligator strap. Water resistant to 30 meters. 39.50mm 18K rose gold case, 7.13mm thick, with see-through sapphire crystal back, 18K rose gold crown, sapphire crystal, anthracite dial, L.U.C 96.12-L automatic movement, approximately 65 hours of power reserve, brown alligator strap with hand sewn matching tones, 18K rose gold pin buckle. Water resistant to 30 meters.